1. For the leaves, halve the vanilla pod and scrape out the seeds. Add the pod and seeds to the beaten egg and set aside to infuse. Mix the flour, baking powder and spices in a bowl. Using a freestanding mixer fitted with a paddle, cream the butter and icing sugar together. Strain the infused eggs, discarding the vanilla pod, and add to the creamed butter mixture; mix for 2. minutes. Sieve the dry ingredients into the eggs and butter, then mix until combined, taking care not to over-mix. Wrap the dough in cling film, press into a flat square and leave to rest for 1 hour in the fridge. 2. Using a rolling pin, roll the dough between 2 sheets of baking parchment to about 0.4cm thick; set aside. At this point, the dough, still in the parchment paper, can be wrapped in cling film and kept in the fridge for up to 2 days. 3. For the chocolate tree trunk, mix the dry ingredients together in a bowl. Using a freestanding mixer fitted with a paddle, cream the butter and icing sugar together. Add the egg and mix well. Sieve in the dry ingredients and mix until combined, but take care not to over-mix. Put the dough on a sheet of cling film and wrap, making a cylindrical shape, about 12cm in length. Chill in the fridge for at least 20 minutes, or for up to 2 days if making in advance. 4. When you’re ready to bake the leaves, preheat the oven to 180˚C, gas mark 4. Using the stencil, cut the rolled sheet of leaf dough into the 8 different-sized star shapes (cut the stencil as you go). Place on parchment-lined baking trays, well spaced apart, and bake until golden; the 2 largest stars should be baked together for 15-17 minutes, the next 4 stars for 12-15 minutes and the 4 smallest for 10-12 minutes. Remove from the oven, allow to stand for a minute and then, using a spatula, transfer to a cooling rack and leave to cool completely. 5. To bake the tree trunk, cut the cylinder of dough into 7 slices, about 1.5cm thick. Place on a parchmentlined baking tray and bake for about 20 minutes. Remove from the oven, allow to stand for a minute and then, using a spatula, transfer to a cooling rack and cool completely. 6. 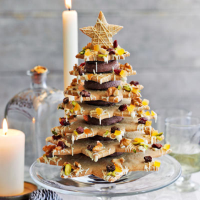 To assemble the tree, spread a little chocolate sauce onto a trunk biscuit and press into the base of the largest star, making sure it’s central. Turn over, leave to set for a few minutes and repeat with the remaining stars, reserving the smallest, 5-pointed star to put on the top of the tree later. Use more chocolate sauce to glue the trunk bases to each star in ascending order, staggering the tips as you go. Try to keep all the biscuits as central as possible, so the tree is stable. 7. To decorate the tree, put the white chocolate in a bowl and microwave on low power for 15 seconds. Remove the bowl and mix well. Repeat until the chocolate is fully melted. Put the melted chocolate in a disposable piping bag and cut the tip to make a small hole. Drizzle the chocolate all over the tree, especially around the edges (alternatively, you can use a teaspoon). Put the dried fruit and nuts on the branches to resemble tree decorations. Drizzle a lattice of chocolate over the smallest star, dip 2 of its points in the chocolate and place at the top of the tree, holding for a few minutes until set. Dust the tree with gold stardust before serving.